Scarlett Johansson, Pilou Asbæk, Takeshi Kitano et al. DVD: 103 min., Blu-ray: 107 min., Blu-ray 3D: 107 min., 4K Blu-ray: 107 min. Scarlett Johansson is terrific in the visually stunning 'Ghost in the Shell', an action-packed adventure set in a future world where people are enhanced with technology. 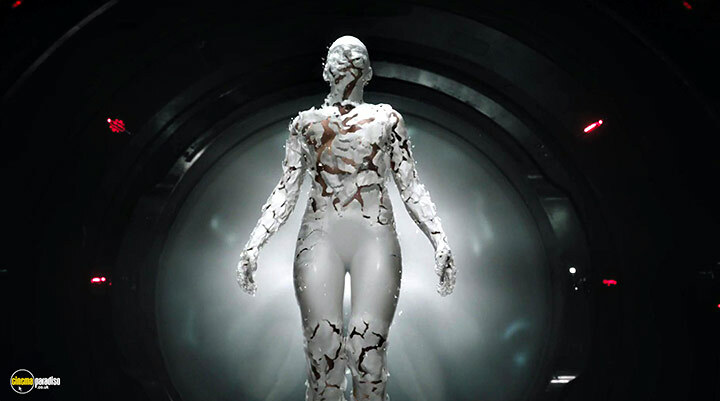 Believing she was rescued from near death, Major (Johansson) becomes the first of her kind: a human mind inside an artificial body designed to fight the war against cyber crime. While investigating a dangerous criminal, Major makes a shocking discovery -the corporation that created her lied about her past life in order to control her. Unsure what to believe, Major will stop at nothing to unravel the mystery of her true identity and exact revenge against the corporation she was built to serve. 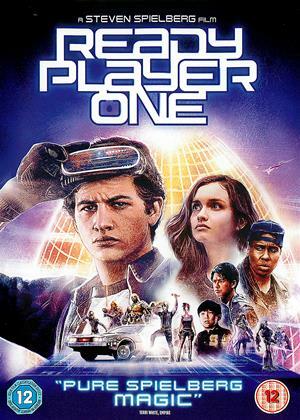 Ignore the poor reviews, it was never meant to be a "live action" version of the 1995 animated film, but a new version with Western audiences in mind. It's proper sci-fi because it's there to make you think, not worry about who's been cast in the lead role, or comparisons with other sci-fi "universes". Scarlett Johansson is superb in the role btw. It still captures the essence of the 1995 film in that it's asking questions about what it is to be human and the practicalities and consequences of "enhancement" from the very opening scene. The score is not as impactful as the 1995 film but otherwise it's very well done and is visually stunning. This is emotionally cold but grown-up sci-fi, intriguing both visually and philosophically. It’s a pity the characters are so bland and earnest, with actors delivering their lines in such a stylised flat manner that they’re difficult to engage with. Much of the film is shot in darkness with lots of intense whispering. Even the futuristic cityscapes, although beautifully rendered by cgi, are never as thrilling as in animated versions of the manga. It comes over as a downbeat mood piece that needs more pace and characters to root for. The plot only really kicks in half-way through, when Michael Pitt appears as an adversary to our heroine Scarlett Johansen (a human mind in a robotic body). This adds some much needed drama to proceedings but only leads to a silly climactic fight with a ‘spider tank’. In summary, the whole is less than the sum of its parts but there’s much to look at along the way. A film about the Ghost in the Shell which lacks any sort of soul whatsoever, the script is beyond dull and the performances look like they've been dialed in from an old folks home just outside of Reno. This wants to be meaningful and intelligent but fails dismally becoming overblown and portentous before finally attempting to bore the viewer to death with is empty stylised vision of the future which looks like it been directly copied from Blade Runner. Avoid. Whilst the director has done a brilliant job of transferring the visual feel of GitS from Anime to live action, the same can’t be said for the script. Gone is the beautifully poignant commentary on what it is to be human, and instead it is replaced with stock Hollywood plot #4: underdog seeks righteous revenge upon evil corporate. Yawn. Have to give it a 4, instead of preferred 3, as is just so much junk out there at the moment. Some of sub players a bit ordinary. Is Blade-runner meets AI. A great deal of Blade-runner city going on..........which is OK. I am a big fan of Scarlett Johanssen, but this film just didn't grab me at all. I found it djsjointed, plodding, and I found myself spending most of it on my phone rather than watching it! Yet another dystopian sci-fi about someone who discovers they've had their memory erased so an evil corporation can exploit them for nefarious purposes. Remember Robocop, Total Recall, Paycheck and The Matrix? The problem here is that it's become such a tired plot-line by now that it's hard to become involved, and there's little real tension about what's going to happen because it's obvious from the outset where this is going. The visuals are generally very impressive (if derivative - see Blade Runner and The Fifth Element), though the CG suffers a little from the overly-busy look that so often dominates films like this. Visual style just isn't enough though. Even Johansson, who's such a safe pair of hands, can't really make this work because her character is so off the peg - even if she is essentially naked for half of the film! Another bloated wasted opportunity from Hollywood - not awful - but only for real fans of science fiction and/or Scarlett Johansson. If you really want to see an interesting science fiction film about identity, that also stars Scarlett Johansson in a state of constant undress then give Jonathan Glazer's 'Under the Skin' a try instead - a genuinely thoughtful, disturbing and visually original piece of filmmaking. Much, much better than expected from previous reviews. Scarlett didn’t disappoint. As long as you remember it’s a fantasy SF then go out for the ride. Film, direction, structure superb. I rated it a 3 because I felt although a decent enough film, a little more could have been made of the plot line. It was subtle which I like but did come across as a little disjointed. It was a film you had to work at a little to keep watching, not always in a good way. The acting was OK, special effects reasonable. A good mark of a film is whether I would rent it again, or possibly purchase it....with this Movie I think it's a watch once and enjoy. Definitely worth a rental though. We hadn't seen the animated version or read the book so we came to this clean. My husband and I both though it was a little wierd in places and much of it reminded me of Blade Runner but we both enjoyed it enough to stop doing other things and watch the film which is always a good sign since nine times out of ten we are too engrossed in other things to give the film we are watching our full attention. But then the film has a good enough story that does make you think, especially about what those that have could do to people who don't have without their permission. Having seen the original anime release, which was pretty spectacular, I put this onto my rental list. The film did not disappoint. Although it is not supposed to mirror the original animated film, there were a few scenes lifted directly from the anime and they were done well, especially the chase through the puddles and some of the bird's-eye panoramas of the city. Scarlets Johannesburg was brilliant as Major. An enjoyable film with a serious message. Awful film, poor acting, ridiculous story and the effects are not that good. Save your time and money and don’t bother. 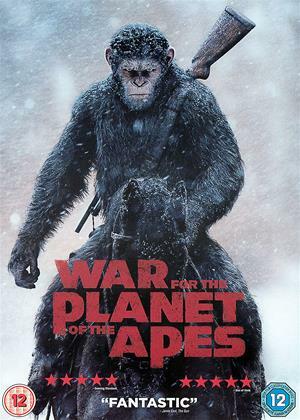 Not a bad film overall so l give it 3 stars as worth a watch. Its hard finding films to take advantage of the great upgrade on 3d provided by the new 4k screens even though its only 1080p to each eye . 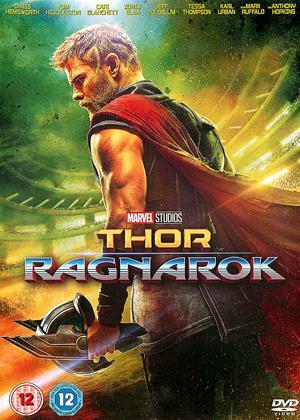 Definitely worth watching if your in to sci- fi action etc ,both the wife and I thought it was a thoroughly entertaining ride, not hugely innovative but different enough. It also had great soundtrack if you have a surround system,picture and sound first rate.Will be trying JBs under the skin. That annoying title keeps being repeated all through the movie like some trite but worshipful saying...Japanese comic writers think they are being Deep and Meaningful....Nah,just a little embarrasing to be honest. 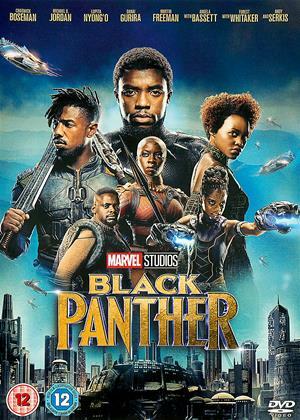 Anyway, The movie is actually pretty good, Entertaining ,Action,Sci-fi. Sort of from the same future as Bladerunner from the looks of it. and it comes across pretty much as a female Bladrunner type film. Only this female is just a Human Brain in a Robot body . but she looks good, moves gracefully and cant remember a damn thing about herself .well not until she gets some help from the cyber criminal she is chasing . Beautiful visuals, Stylish Violence and certainly very Watchable . 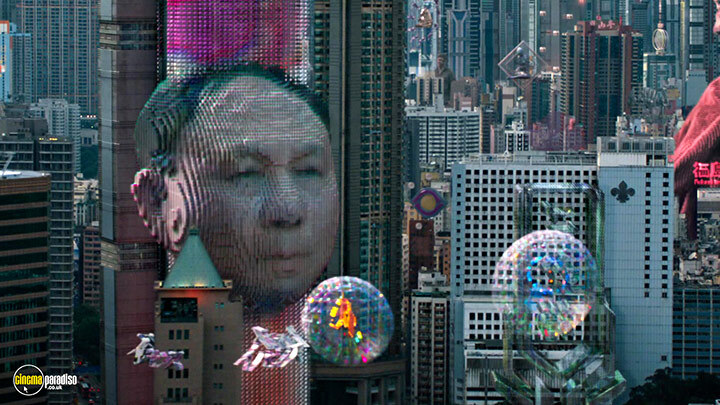 It’s been over twenty years since Mamoru Oshii’s Ghost in the Shell redefined animation and sci-fi filmmaking. It became a major influence on the cyberpunk genre, serving as a key inspiration for The Matrix. But after so many years of expanding science fiction into unique and original directions, Rupert Sanders’ live-action remake of Oshii’s animated classic comes off more as a love letter than an extension of the franchise. He spends most of the movie proving how well he understands this cyberpunk universe from the depths of cyborg technology to which breed of dog one of the heroes prefers. The multiple writers, however, have dumbed down a world that was once brimming with endless ideas about culture, technology and psychology. The story is posed to be a much easier tale of lost identity to make the world a little more accessible for newcomers. Scarlett Johansson plays Major, the first woman to have her brain transplanted into a fully robotic body. Johansson is a strong enough choice for such a role given her curiosity and fear of her body in Under the Skin. Her character vaguely remembers her past before having her gray matter scooped into a robot, appearing as blips in her digital vision. There’s no time to look into her past, however, as her robotic skills are farmed out to the government organization Section 9. While she wonders about her visions, she’s sent on missions where she can smash through glass in invisibility camo to shoot at robotic geishas. 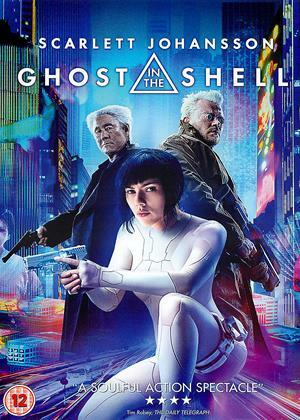 This version of Ghost in the Shell attempts to be more character based than focussing on the heavier themes. I get that; average action-seeking audiences would probably squirm if their robotic shootouts ceased for long talks about humanity’s evolving reliance on technology. It’s also a more interesting route as few of the Ghost in the Shell movies/series have deeply explored the origins of the characters. I didn’t need an explanation for how Batou acquired his bottlecap robot eyes, but it didn’t hurt to include it in the script. Even when divorcing from the fact that this iteration will be a dumbed down Ghost in the Shell, I still found myself being let down by this plot. The movie seems to be in such a rush to sprint towards the next flashy and stylish action scenes that the dialogue is dumbed down for time. We’re never given much time to sympathize with Major’s plight because her dialogue is so base and to the point in between firing guns. Her key mission of uncovering a terrorist hacker not only coincides with her past all-too-conveniently, but the villain she tracks down appears as a reject from A.I. Artificial Intelligence with a Max Headroom sputter. 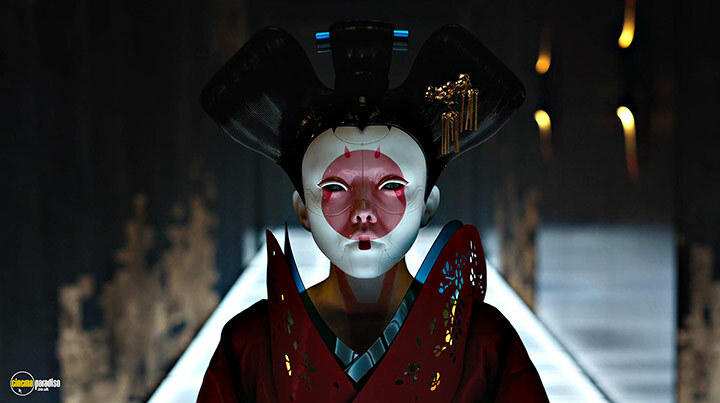 Where the film excels best is Rupert Sanders’ faithfulness to the world of Ghost in the Shell, proving his fandom through the visuals. Several iconic shots from the original film are replicated almost shot for shot, from the watery fight down an alley to the battle with a spider tank. 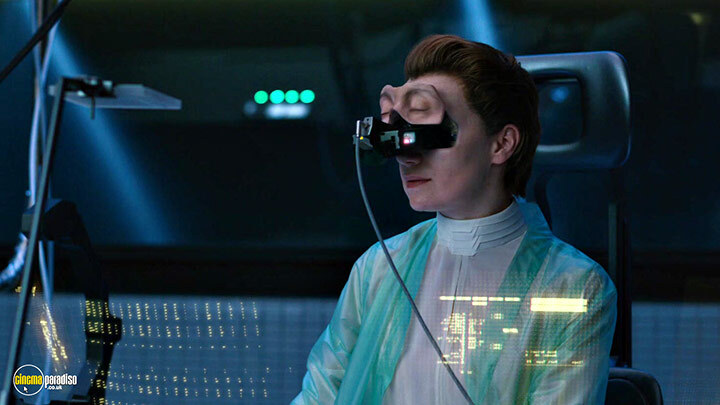 Even the most minute of details are adhered to as when the forensics cyborgs have to open up their eyes sockets to properly monitor diagnostics. I’m thankful that he only borrows the visuals of the previous film and not the exact same plot. I could only imagine how watered down the dialogue of the Puppet Master would be if he were filtered through this simple script. There is the issue of whitewashing the character of the Major which becomes all the more apparent and odd when they reveal her brain to actually be that of Motoko Kusanagi. It could be considered either extremely insensitive or weirdly genius that the evil plan of the true villains in the picture are enacting whitewashing. I personally found it just to be odd, even if the choice makes sense from the scheme of a dastardly evil corporation. Whether that corporation is the one in the film or the one behind the film is up to the viewer. The whitewashing wouldn’t be such a big deal if the race swapping weren’t applied to the rest of the core cast. The only Japanese actor who actually speaks Japanese in the film is Beat Takeshi as chief Aramaki. Takeshi reminds me once again why he’s a damn fine action actor, even in his old age when given big white hair for this role. I was never bored by Ghost in the Shell or all that appalled by the reworking of the material. At the same time, I never felt as though I learned anything new about its world which seems ripe for more exploration past its dominating cityscapes that dwarf Blade Runner. 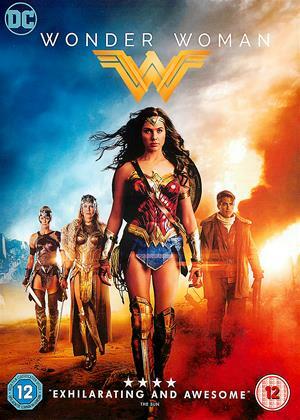 All this potential with fantastic action sequences and beautiful world building feels wasted on such a familiar and tiresome script of one woman searching for her past. I’ve seen this story so many times that top-notch CGI and the right atmosphere can only go so far in masking such a simplistic script. The good news is that the Ghost in the Shell animated franchise is far from dead, which makes me a little more hopeful that others will rediscover through the anime versions through this picture. Those that do will be pleasantly surprised that plethora of animated films/series explore far more than could ever be covered in a big-budget, low-intelligence Hollywood blockbuster.